A blend of natural plant extracts has been developed at The Laminitis Clinic to supplement the diet of "good doer" horses and ponies. Pony 1. 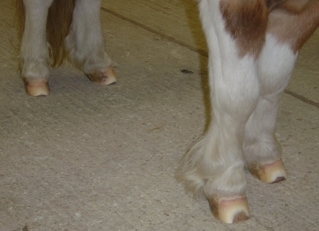 Typical appearance of chronic founder feet after corrective trimming which exposes the crescents of laminar horn at the toes. Despite being trimmed correctly every five weeks he still suffered from laminitis from time to time. The same pony as shown in the picture above. 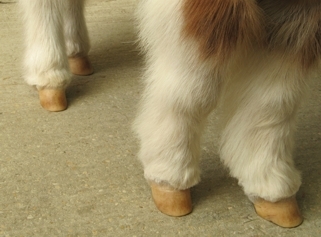 He started receiving the product six months previously and has not had his feet trimmed since! The feet could do with a trim but there is no longer the distortion characteristic of chronic founder: his feet have grown downwards compared to growing forwards previously. He has not suffered an attack of laminitis in the interim. These results indicate completely normal insulin sensitivity as reported by Eiler, H., Frank, N., Andrews, F.M., Oliver, J.W.and Fecteau, K.A. (2005) Physiological assessment of blood glucose homeostasis via combined glucose and insulin testing in horses. Am. J. Vet. Res. 66.9.1598-1604.